This home is fully furnished and suitable for oversea students who study at Latrobe Uni or RMIT(bundoora). 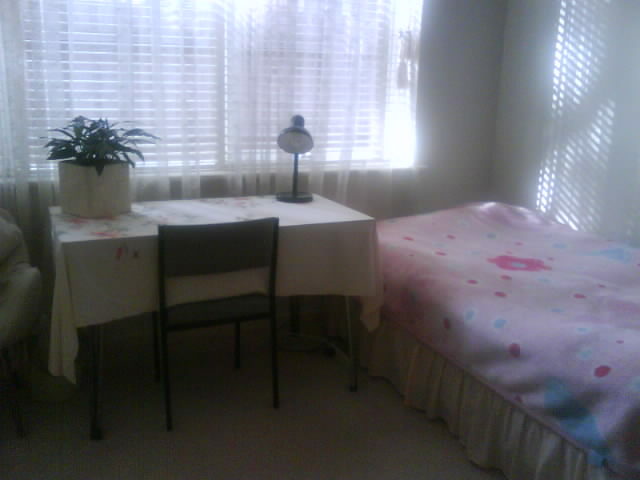 The bedroom is clean & bright with bed/pillow/blanket, desk/chair, lamp, bookcase, wardrobe, mirror, ect. Modern bathroom is spotless clean. Kitchen is fully equipped, just buy your own grocery & start cooking! Broadband internet is availble. The house is located only 5 mins walk to tram 86. 12 mins walk to Latrobe uni. 15 mins to RMIT by tram. Bus 552 nearby will take you to Northland Shopping Centre and Bus 561 takes you into Latrobe campus or Reservoir. I have a house cat, don't apply if you're allergic to cat. Otherwise if interested, please contact to arrange an inspection.